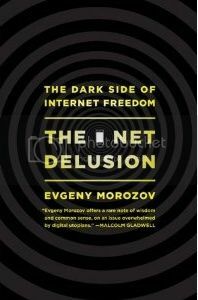 NOTE: This is the fourth in a series of posts reviewing the book “The Net Delusion: The Dark Side of Internet Freedom” by Evgeny Morozov. Here are the links to the first post , second post and third post. This post was updated on March 26th, 2011. Warning: this will be one of my more critical reviews of The Net Delusion. The reason is simple: in the chapter I’ll be addressing in this post Morozov attempts to debunk the value of digital activism. This is a false premise and easily refuted. I’ll do so vigorously. Let’s begin. Alas, those charmed by the promise of digital activism often have a hard time distinguishing it from “slacktivism,” it’s more dangerous digital sibling – a mad shopping binge on the online identity supermarket that is Facebook – that makes online activists feel useful and important while having precious little political impact. If people do have difficulty distinguishing between the two, it’s a result of rhetoric like Morozov’s. So let’s take a moment to clarify. Slacktivism is to digital activism as advertising jingles are to music: the former is the most superficial and inane incarnation of the latter. Another clarification: Digital activism is the use of digital technology in activism, but does not imply that activists should use only digital technology. Perhaps in the late-nineties hay-day of e-petitions people (though not serious activists) thought this, but last I checked the institutions of political power exist in the real world, so activists too must make that leap. People like myself, who are optimistic about digital activism, are interested in the way activists can use these technologies as part of their overall strategy. We’re not advocating use of digital technologies to the exclusion of other tactics and tools, especially when this technology does not serve the strategic goals of the campaign, which is often the case. Perhaps the term should be “activism with digital integration” or “digitally-enhanced activism” to clarify that digital technology use is only part of successful campaigning. To claim that proponents of digital activism are promoting the exclusive use of digital technology in activism is just another one of Morozov’s straw men. Setting up a binary distinction in the social sciences is the sure sign of a flawed argument. Almost any complex phenomenon, from human sexuality to democracy, exists along a continuum. In this chapter Morozov presents two binary dichotomieson slacktivism (his proxy for all of digital activism): the effectiveness dichotomy and the activist authenticity dichotomy. Inpresenting the effectivenessdichotomy Morozov, the great fan of anecdotes, gives only four examples of digital activism campaigns, two of which (One Million Voices Against the FARC and the Free Monem campaign) could be counted as successes. Yet the one he harps onis a Facebook group called “Saving the Children of Africa”, chosen because its message is very appealing (hence high membership)and its ability to achieve its goal is lofty goal is quite obviously low (hence a good example of ineffectiveness). Morozov points out that though the group has 1.7 million members, it has raised only $12,000 (fundraising is not the mark of a successful campaign, but I digress). He has successfully identified an unsuccessful example of digital activism. This is not that hardbecause, as Clay Shirky has pointed out,startinga group onlineis vanishingly easy and this low bar to participant in digital activism means there is a lot of unstrategic dross. Just because some – even most – digital campaigns are unsuccessful does not mean that digital activism itself is valueless. Just as the scads of Auto-Tuned pop songs do not signify that music is valueless, the existence of a million ineffectual Facebook groups does not mean that digital activism is valueless. If one Facebook group like We are All Khaled Said was critical in mobilizing a successful revolution in Egypt, then the phenomenon is worth looking into. Also, most instances of digital activism fall somewhere between useless and revolutionary on a continuum of effectiveness. There are Mozart and Ke$ha equivalents in digital activism, but also some Coldplay, some Common, some Josh Grobin: campaigns that have some measure of success, albeit at a less world-changing scale. Even Facebook activism exists along a continuum. It’s one thing for existing and committed activists who are risking their lives on a daily basis in opposition to the regime to embrace Facebook and Twitter and use those platforms to further their existing ends…. It’s a completely different thing thing when individuals who may have only cursory interest in a given issue (or, for that matter, have no interest at all and support a particular cause only out of peer pressure) come together and start campaigning to save the world. Digital activism often fails to move people to the next rung of the ladder, the classic example being the person who indicates interest in a cause by joining a Facebook group but never takes further action. Clearly successful tactics for the digital ladder of engagement have not yet been perfected. Facebook itself launched in 2004 and Facebook activism is an even more recent occurrence. Tactics for Facebook mobilization will likely improve as well. Though there will likely always be inactive “Saving the Children of Africa” groups, there will likely also be groups that determine a course of action (even if it is simple successful fundraising) that achieves its goal. Revolutions prize centralization and require fully committed leaders, strict discipline, absolute dedication, and strong relationships based on trust. In fact, this seems like a reasonable summary of the elements of successful activism, but digital technology is challenging and changing all of them, especially in the recent democratic revolution in Egypt. Though these events occurred after Morozov’s book was published, they are evidence of Morozov’s blindness toincipient changesin digital activism, and thus inability topredict theirturn from “great potential” to reality. Revolutions (need not) prize centralization: While activists do need a shared agenda in order to achieve collective action, centralization does not seem to be as important as it used to be. What is important is to reach consensus on actions to be taken, and while centralized and hierarchical decision-making used to be the only way to to it, the rapid mass deliberations on platforms like Facebook make other methods of decision-making possible as well. Wael Ghonim, the most well-know admin of the Khaled Said Facebook group, stated that all important decisions that the group made were reached by survey. Though the center did broadcast these decisions, they had been reach in a networked manner. … require fully committed leaders (participants) : Another extremely interesting aspect of the Egypt case was that it was leaderless. Those who appointed themselves to negotiate on behalf of the protesters, like the Muslim Brotherhood, were not seen as legitimate by those in the streets and the person who came to represent the movement, Wael Ghonim, repeatedly declared himself neither a leader nor hero. The implications of leaderless revolutions which, because of their “headless” capacity, would be harder to co-opt or incapacitate, has yet to be fully developed. …strict (peer-enforced) discipline: Discipline is still necessary in digital revolutions, but it looks different. It is not top-down but peer-driven. The discipline with which each protester decided to remain non-violent was decisive, yet it was not a hierarchical discipline. Just as protesters coordinated to keep Tahrir Square clean without being told to, they keep each other non-violent, voicing their commitments repeatedly and chastising protesters who brought weapons to the square. …absolute dedication (of the initiators): Certainly Wael Ghonim and the members of the April 6th Youth Movement had absolute dedication to the cause of democracy, yet many of the millions who poured into the streets of Cairo during the final days of the protestsdid not. (If there really had been millions of die-hard activists in the Egyptian population, Mubarack would hav been ousted long before.) Instead, ordinary Egyptians moved up the ladder of engagement, encouraged to join by what they saw around them, leading to a cascade that drew in the passionately political and finally the merely dissatisfied. This is the same pattern of information cascades that occurred in Leipzig at the end of the Cold War, only at greater, digitally-enhanced velocity. …and strong(and networked) relationships based on trust: This is one of Gladwell’s arguments, that only the strong ties forged offline will lead people to fight and die for one another and that the digital world cannot build such ties. Whether this is true or not is irrelevant because online and offline ties are not separate. They are often mutually reinforcing. Especially on Facebook, a platform that encouraged people to connect to those they also know offline (as opposed to, say, MySpace), it is reasonable to believe that people received both online and offline cues about the actions their friends were taking and that this awareness of protesters among one’s social network encouraged the less political to join. However, not all the protesters knew each other. In a rally of over 1 million, how could they? How trust works in a network, where Z trusts X only through their mutual acquaintance Y, has yet to be fully analyzed. The fact that Morozov casually makes this statement, which is critically at odds with the evolving trends of digital activism, is significant. It appears that, in his eagerness to downgrade the importance of technology he is unaware of the changes technology is bringing. Great series of critiques to an interesting book, but I’m not so sure the events in Egypt contradict Morozov’s overall point. Egyptians succeeded in ousting Mubarak, but now the country is ruled by a military junta and continues to see (sometimes violent) protests. It remains to be seen whether there will be a real transition towards democracy. Morozov repeatedly emphasizes that for activism to promote democratization, it has to do more than just kick out tyrants but also help build the strong institutions necessary for a healthy democracy. Egypt’s activists have been far less successful at the latter task. Hi Neil – Evgeny’s point is that digital tech is more a tool of repression than liberation. The Egypt case disproved this as the activists used digital technology to liberate themselves (among a variety of tactics). The argument that digital tech leads to democracy has been discredited as overly simplistic. We may find that digital tech is better at mobilization than the many subtle checks and balances necessary for the creation of a democratic society. This outcome would show a limitation of current digital tactics, but would not invalidate its previous successes. Reading this quote from Morozov’s book i kinda think you both may be on a similar, if not the same, page. He seems to agree that Facebook activism (and in effect digital activism as a whole) can be effective as long as it is mastered correctly and not used as a sole method of seeking to change the world.